You did it. You landed a first date with someone you definitely want to get to know better. Now what? And don’t say dinner and a movie. You want to avoid clichés in this new relationship, not live them. Besides, experts have found that doing a fun activity together creates more bonding than sitting in front of the big screen. But if dinner and a movie was your only idea, don’t panic. We have a suggestion: Go bowling. While maybe not top of your list of first date ideas, it actually has all the elements you need for a memorable first time together. The bowling alley provides the perfect low-stress environment. First dates are stressful enough without having to worry about dressing up and remembering which fork to use during the salad course, are we right? So ditch the fancy clothes and cutlery and embrace a low stress environment, like that found at a bowling alley. When you go bowling, you don’t have to pick the perfect clothes (What kind of casual should you go with?). You don’t have to worry about sitting properly at a fancy table or trying to figure out what escargot means. Instead, you can dress in your favorite jeans and t-shirt, show up in your sneakers, and cut loose with a game that is nothing if not relaxed. And if you are more relaxed, chances are your entire time together will feel just a little bit more authentic and fun—two qualities that will make a good impression on anyone. The bowling alley provides the perfect conversation starter. Imagine this: You finally nail the perfect outfit, show up on time to the restaurant, place your order, stare across the table at your date…and realize you have nothing to say. Sounds like a first date nightmare, doesn’t it? Well lucky for you, you can avoid this particular bad dream by taking your date to the bowling alley. Rather than having to make strained comments about the weather over your entrees, you can share your bowling experiences, learn how to play the game together, challenge each other to top a high score, or choose silly bowling games like Bingo or Truth and Dare to get the conversation started. As an added bonus, the relaxed atmosphere of the bowling alley and the laidback style of the game will help you to feel more comfortable too. And that can mean that conversation flows more easily than it would in the restaurant. The bowling alley gives you the opportunity to talk. While you want to avoid an strained conversation over dinner, you also want to avoid a first date that doesn’t include much chance to talk at all. It might be safe to say that if you don’t know more about your date after your time together, than you haven’t had a very successful first date. Avoid communication problems by choosing bowling for your first date activity. 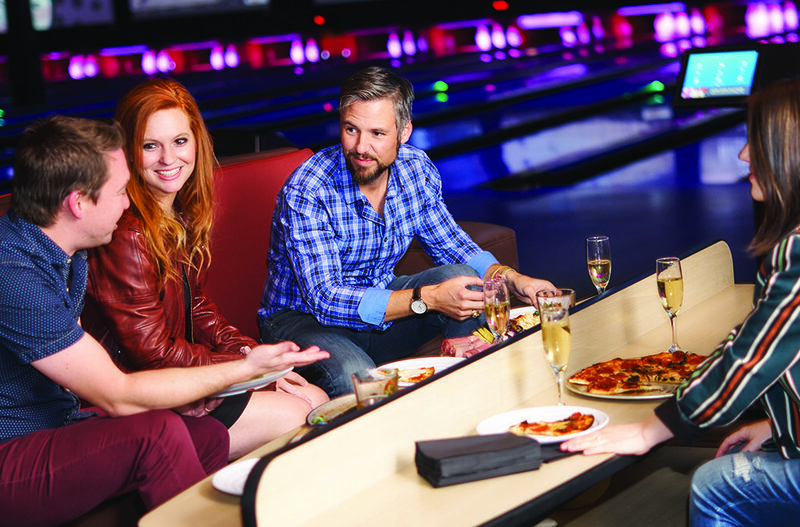 In addition to the laid back environment discussed above, bowling lends itself to conversation because of the pauses between frames where you can chat and the opportunity to talk during laneside food and beverage services. With no need to hurry and lots to do after the game, you can take your time and let the conversation go as long as both of you like. And that could certainly lead to future dates. The bowling alley gives you a glimpse into the character of your date. Getting to know your date is the goal of spending time together. So choose an activity that really lets you see who the other person is: Bowling. Your date might be all sweetness and calm over dinner, but get them in front of the bowling lane and they show off their competitive side. Or, you might find that their brusque nature gives way to a courteous and thoughtful temperament in the midst of competition. You might find a worthy partner for lighthearted verbal sparring or unexpectedly find someone with the same drive to succeed that you do. Either way, when you get to see them play a game with you, you get to learn a little more about their character and personality. And that can help you decide how much you want to see them again. Sounds like the perfect first date activity to us. Just be prepared, your own personality will be coming out as well. The bowling alley gives you plenty of things to do. Boredom will kill a first date faster than almost anything else. So avoid the dreaded down time by choosing a bowling alley that gives you plenty of things to do. And we don’t mean letting you play endless frames, unless, of course, you want to. Instead, avoid boredom or extend an already amazing date by moving on to some of the other activities available in the right bowling alley. For example, here at PINSTACK, we offer laser tag, video games, bumper cars, and even indoor rock wall climbing. And if you are hungry, you can order laneside food and beverage service or stop by our scratch restaurant for upscale American cuisine. And that means that your first date can go as long as you both want it to. If you want a first date idea that will be memorable and fun, consider bowling. With its low-stress environment, ability to facilitate conversation, option for eating and doing other activities, and opportunities for creative and appealing games, you can enjoy a first date that is vibrant and enjoyable. Here at PINSTACK, we offer upscale bowling, laneside food and drink service, a private bowling area if you want it, and amenities and activities that allow you to extend your date as long as you want. And that means you can accomplish more than just a first date: You might be well on your way to future dates.